The best gray paint options from Benjamin Moore. A neutral color at its core, gray encompasses a moody element in a room that is at once inviting and alluring. With a variety of shades from light to dark, gray has become a trendy color to use in almost every room in your home. Just the name alone sends chills down our collective spines. This dark, moody color may scare away some people who fear that using dark colors makes a room feel smaller. That is simply not true. Truthfully, dark colors can actually have the opposite impact by making the walls simply disappear, creating drama and a very bold statement. This beautiful color, enhanced by the deep charcoal and a hint of brown, adds warmth to any room. 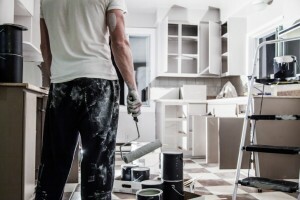 Are you thinking about giving your kitchen a little paint update? Then this color is perfect for you. With its perfect shade of medium-light-gray, it goes beautifully with cabinets and vanities. This color is able to give off a sense of warmth in a room without giving off any hint of brown, leaving it very light. A classic color that is sure to make a statement without being overly loud. This super classic gray is both sophisticated while not being boring. This color is an extremely warm gray, which means it maintains it’s cool tone with touches of yellow in it, as opposed to the common blue hue. This light and airy paint is a whisper of a barely there color. This particular gray avoids going green, or blue, or even lavender, making it the perfect neutral backdrop for any room. The best paint colors are those that have dimension to them, and this paint color has plenty of dimensions. This versatile paint color is able to make a subtle shift from day to night, with it’s very subtle warm brown notes and warmth. As a deep, dark gray, this paint color makes for a beautiful matte finish on any wall in your home, even working well as a satin finish on millwork. But the best way to use this beautiful paint is on cabinets in your kitchen, creating a warm, inviting oasis for your whole family to enjoy.